Cylinder liner is a cylindrical part of the engine which acts as the enclosure in which the combustion takes place. It is the crucial functional part which is used to make up the interior of the engine. The global automotive cylinder liner market is estimated to be valued at USD 3,895.6 Million in 2017 and is projected to reach USD 5,761.2 Million by the end of 2027, expanding at a CAGR of 4.2% over the forecast period (2017-2027). In terms of volume, Asia Pacific is anticipated to portray significant growth in the global cylinder liner market. Increasing passenger cars and LCVs market growth is anticipated to show a wide growth in automotive cylinder liner market. European market is rising due to the increasing penetration of automotive vehicle among people and rising demand for passenger and commercial vehicle in urban cites. Moreover, advancement and availability of wide range of cylinder liner such as stainless steel cylinder liner, cast iron cylinder liner, titanium alloy cylinder liner, aluminum alloy cylinder liner and other engine parts of a car in the region is fostering the growth of automotive cylinder liner market. Further, Germany, Italy and Spain are expected to account for the largest share of revenue by 2027. The automotive market in Asia-Pacific countries such as India, China and japan is expected to benefit from rapid urbanization. Further, titanium alloy cylinder liner is expected to continue to see its use in future vehicles. This factor is envisioned to bolster the growth of automotive cylinder liner market. Moreover, presence of large number of automotive players in China is anticipated to strengthen the growth of the automotive cylinder market. Global automotive cylinder liner market is wholly dependent on the growing economies. In addition, growing use of automobile vehicles in the developing nations such as Asia pacific countries like India and China are aiding to the growth of the market. Growing population in urban cities is one of the key factors which are driving the market of automotive industry. Furthermore, factor such as increasing number of heavy trucks and growing demand for passenger vehicles are driving the market for automotive cylinder liners. Titanium alloys are preferred for luxury and sports cars. Owing to these factors, the demand for automotive cylinder liners is expected to rise in the global automotive industry over the forecast period. 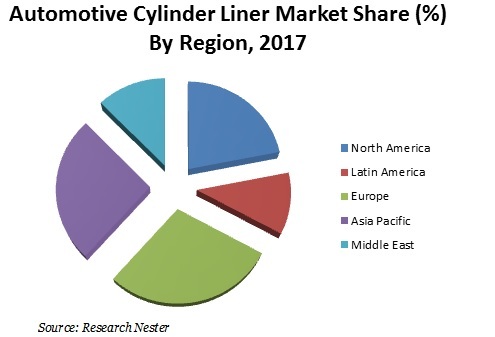 Moreover, increasing adoption of passenger cars is expected to boost up the sale of passenger car cylinder liner market. Factor such as ease of availability, continuous improvement and attractive looks is believed to attract more automotive customers. Consequently, the demand for automotive cylinder liner is believed to increase during the forecast period. Major manufacturers are focusing on development and marketing of the stainless steel cylinder liner and cast iron cylinder liner. High cost of titanium cylinder liner is expected to diminish the market growth. Moreover, availability of substandard raw materials such as dry sleeve liner might dampen the growth of automotive cylinder liner market.